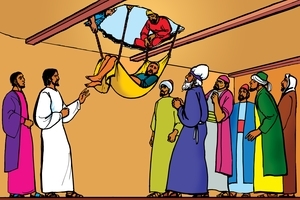 Outline: Jesus healed and forgave the paralyzed man let down through the roof. We can't do good works to be forgiven. Only Jesus can heal us by forgiving us. Jesus forgives us if we truly believe Him. Jesus will forgive you now.